Today's lesson continues the 10 plagues. We studied the first 5 last week, and will review Moses and add the 6-9 plagues. We will finish the plagues next week! You can find the 10 Plagues part 1 lesson here. 2. (8:6) There were frogs…everywhere. Pharaoh said, I will let the people go, if you ask God to remove the frogs. The frogs all died and the people piled them up by the river. They really smelled! 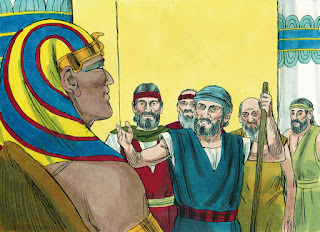 But, Pharaoh changed his mind and would not let the people go. 3. (8:17) There was lice on all people and animals. Pharaoh's magicians tried to make the lice, but they couldn't and told Pharaoh that God's fingers made the lice. But, Pharaoh wouldn't let the people go. 4. (8:24)There were swarms of flies everywhere! Pharaoh said he would let the people go if the flies disappeared, but once the flies were gone, Pharaoh changed his mind and would not let the people go! 5. (9:6) All the Egyptian livestock animals (oxen, sheep, horses, donkeys, camels) died, but all the Hebrew animals lived. Moses had told Pharaoh that the Hebrew animals would not die. Pharaoh went to check on the Hebrew animals, and none of them were sick! But, Pharaoh still refused to let the people go! 6. 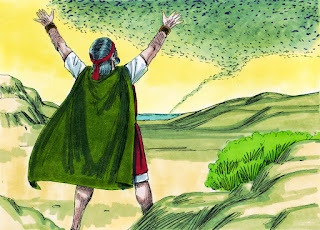 Moses and Aaron went before Pharaoh and took ashes from a furnace and spread the ashes toward the sky. The people and the animals had boils that made sores! 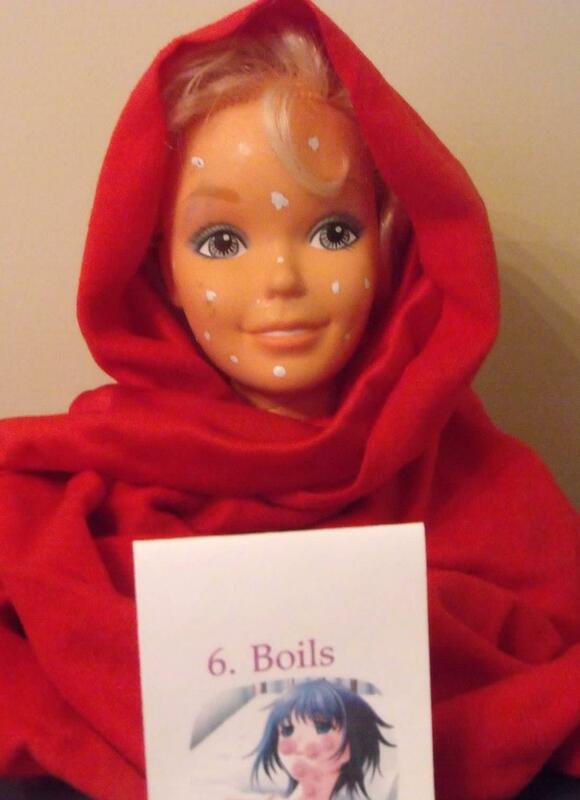 (9:10) The magicians couldn't stay with Pharaoh because the boils were so painful! But, Pharaoh said "No, the people can't leave." 7. (9:23) God told Moses to go see Pharaoh early the next morning and tell him that God is sending a heavy hail to rain down like Egypt has never seen before. If any animals or people are left outside, they will die. Moses held his rod up toward heaven and God sent thunder and hail with fire running to the ground! It was so intense that the Egyptians had not ever seen anything like it! 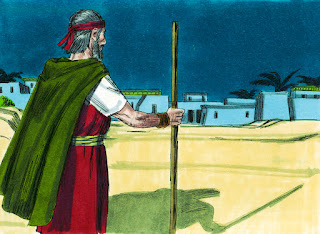 (9:23-24) Pharaoh told Moses that he would let the people go if the hail stopped. Moses left and God made the hail stop, but Pharaoh changed his mind and wouldn't let the people go. 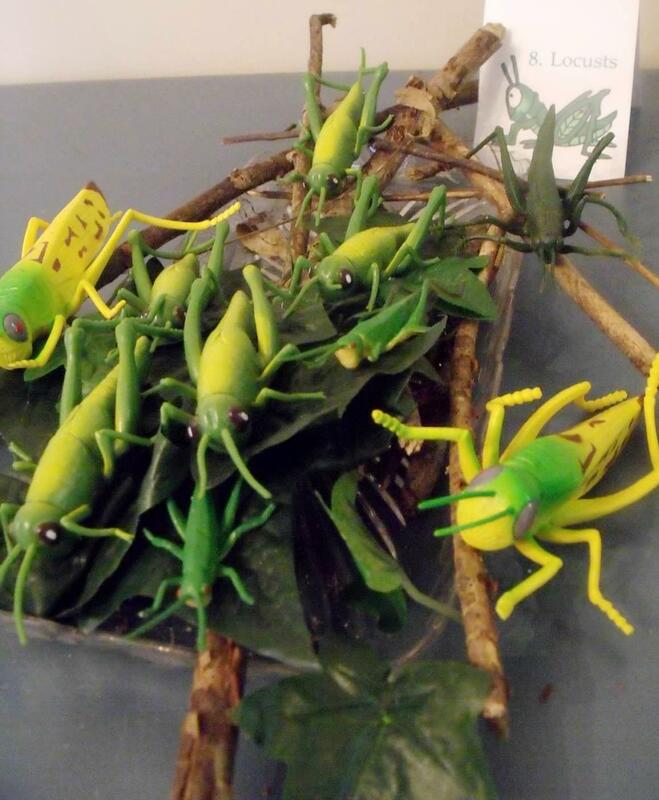 Egypt had not ever seen locusts so severe before! The land was dark with them and they ate everything that was green! Pharaoh called Moses back, and asked him to remove the locusts. God sent a very strong west wind and blew the locust into the Red sea, and then, Pharaoh changed his mind and wouldn't let the people go! Pharaoh is getting more upset. He will not let the people go, and he told Moses that "If I see your face again, you will die!" Moses, replied that Pharaoh would not ever see him again. 10. (12:29) God told Moses that there would be one more plague. And, then Pharaoh would let the people go. We will continue this next week and finish the 10 plagues! 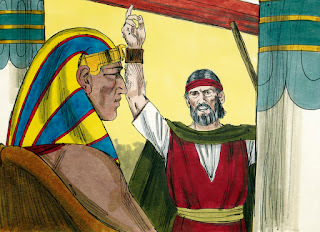 Pharaoh will finally allow the Israelites to leave Egypt! 6. Boils I purchased the dot stickers found in the school department at Target. I used the yellow ones, used a sharpie to make big red dots, then added a white dot on top for the puss. 7. Hail I bought plastic golf balls at Wal Mart. Nicole used ping pong balls, which I had in my hand, but the golf balls were a little cheaper and did not have the writing on them. Paint the clothespins first and let dry. I cut the Chenille stems 1 1/2" for the antennae. I folded the stem in half and opened the clothespin. I glued the antennae to the inside of the clothespin, and pointed the ends forward. I glued the eyes to the Chenille stem on each side of the 'face'. The legs are 2 1/2". I added these next. I folded the stem in half, then bent each end in half again. I glued the middle to the bottom of the clothespin, with the ends "legs/feet" facing down. The back legs are bent in half and glued to the back end of the clothespin on each side. 9. Darkness. This is the last plague today, and, again, using Nicole's idea, I found a 12 pack of sunglasses at Party City. 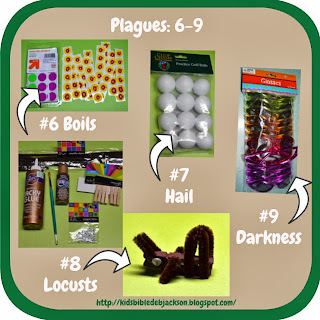 Each week for the 3 weeks we are studying the 10 Plagues, there will be a different take-home project. Last week was the artist palette (which we are using for the 3 weeks) or you could make the paper plate project. This week is a printable for education cubes. 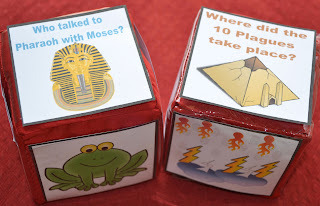 Print, cut and insert into the sections, and then you have a memory game for the 10 Plagues! You could use them as cards to put them in order also. You can have the kids number them and put them on rings to review. Print it here. If you do not have the education cubes, but really want to play the game, you can print this one. This is a set of dice for you to print and put together. I think I would find a square to put inside so it holds it's shape though. You can print that one here. Here is the same picture, but is a picture to color (no cutting). 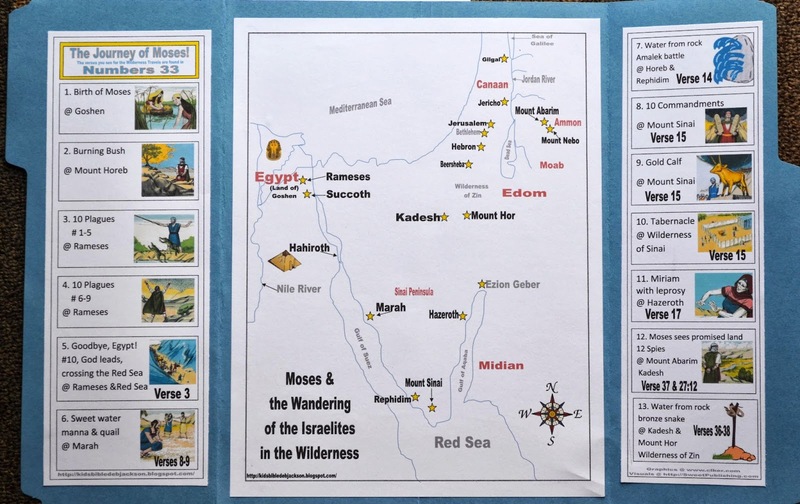 You can see all the Moses cut & glue pictures to color here. 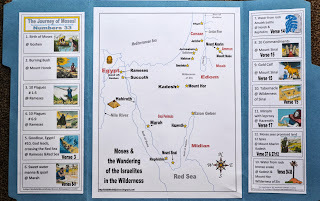 You can find all the Moses worksheets here. 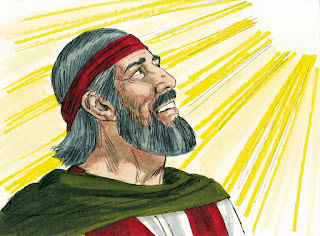 You can print today's Bible verse for the students here (6 per page). Here is the teacher's visual aid with the above Bible verse (1 per page). You can find all of the Moses Bible verses here. Here is a 10 Plagues song that can be printed, laminated and used as a flipchart, book, visual or bulletin board decoration. You can print it here. For more on the 10 plagues, please look here. Also, there is a coloring book on Currclick that you can purchase for $1.00. And, if you are not signed up for their emails and/or Facebook page, you should consider it if you homeschool. They offer free downloads weekly. I print the last page that is a super mini 10 Plagues booklet that the kids love. Because it is so tiny and cute. I print on a color paper. You can find it here. If you want to use the visuals, but considering they are based in Egypt, you can print and draw in shirts to cover them if you prefer. I am personally using the Abeka, and they have clothes on. Excellent teaching material. Thanks for sharing with us at our Thursdays Favorite Things Blog Hop. Thanks for stopping by! I appreciate the comment and thanks for hosting the link up! Thank you for sharing at After School, Debbie! Thanks so much for stopping by! I appreciate you hosting the link up! If you want to use it as a cube, the students roll it and answer the question, or tell what it is and what day the plague was on. It's a fun, different way to review. The printables can also be put in a basket or container. The students can pick one and answer the question or name the plague and the day. You can ask any additional questions to extend the learning.